In Canada, family reunification is a major component of Immigration and the Canadian government is strongly committed to making this happen for as many Canadians as possible. As a result, the Family Class Immigration category is the second largest category in Canadian Immigration. Specifically, within the Family Class Immigration category there are different types of spousal sponsorships that one can pursue, such as spousal, common-law partner or conjugal sponsorship. Additionally, there are two categories to choose from when sponsoring your significant other; you may choose to pursue an inland spousal sponsorship or an overseas spousal sponsorship. 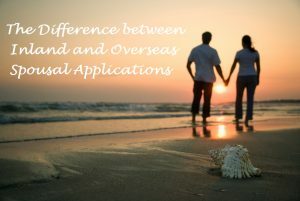 In this article, I will address the different types of relationships and explain the difference between Inland and Overseas Spousal Applications. Currently within the Family Class Immigration category, there are three different categories that apply for spousal sponsorship. The different categories are marriage, common-law, and conjugal. Below I will briefly explain the difference between them all as they can have different requirements for each application. When a Canadian citizen or permanent resident of Canada chooses to sponsor a spouse, they will be required to provide a valid marriage certificate. In addition, if they can provide any evidence of the marriage ceremony or other marriage documentation, this would improve the chances of a successful application. If the sponsor and the applicant do not have any children and have been married for less than two years, they will be required to maintain the relationship for at least another two years after their application is approved. However, if the relationship is unsuccessfully maintained for the duration of the two years preceding the application, then the sponsored spouse may have their permanent residency revoked. This can only be waived in certain circumstances where the spouse can demonstrate and prove abuse or neglect from their significant other. When a Canadian citizen or permanent resident of Canada chooses to sponsor their common-law partner, they must prove that they have been in a continuously living together for at least one year. In order to verify this, the applicant and sponsor can provide appropriate documentation, such as receipts, joint bank account information, and any government documents such as driver’s licenses or insurance policies, to prove that they live at the same address. Although some small employment, family breaks and travel can be permitted, it is essential that both partners remain together in a combined household. It is extremely important to provide as much evidence that the two partners are living together and have combined assets to prove a common-law relationship, as the Immigration officer will have the ultimate discretion on the sponsorship application. When a Canadian citizen or permanent resident of Canada chooses to sponsor their conjugal spouse, they must prove that they have been in a continuous, committed relationship for a minimum of one year. The difference between a common-law relationship and a conjugal relationship is that in a conjugal relationship it is not a requirement to live together. The reasoning for this can be due to several difference circumstances. For instance, there can be significant barriers that are preventing the two of you from cohabitating, such as immigration barriers, sexual orientation, and cultural reasons. It is extremely important to prove to the Immigration officer that these are in fact real barriers and are essentially the reason why you cannot live together. For this specific spousal sponsorship, you are only permitted to apply for overseas sponsorship. 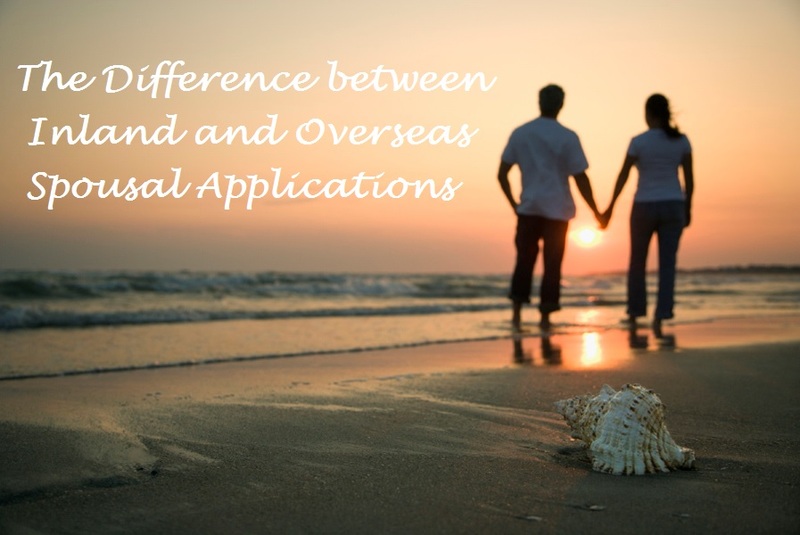 Both inland and overseas spousal sponsorship applications can allow your spouse to come to Canada, however, the two applications can have major differences and it is very important to know them before applying. The main difference between the two applications is where your spouse is currently residing. Luckily, in December of 2016, Canada has announced an improvement in its spousal sponsorship processing times for both inland and overseas applications now being processed within 12 months (one year). When a Canadian citizen or permanent resident of Canada chooses to sponsor their spouse who is not currently residing in Canada, they must then apply for an overseas spousal sponsorship application. The disadvantage to this category of application is that until the application is approved, living with your spouse may be extremely difficult. On the other hand, the spouse may apply for a temporary resident visa to come to Canada while their application is being processed if they choose. However, there is no guarantee that they will be approved for the temporary resident visa. In contrast, when a Canadian citizen or permanent resident of Canada chooses to sponsor their spouse who currently resides in Canada, they must then apply for an inland spousal sponsorship application. The one requirement for this category of application is that the spouse requires a valid temporary visa or proper authorization to be in the country. A major benefit of this category of application is that your spouse may be eligible to apply for an open-work permit while their spousal sponsorship application is being processed. This essentially allows them to work anywhere and for any employer in the country while waiting for their application to be approved. Additionally, in December of 2014, there have been faster processing times for spouses looking to apply for an open-work permit. In whichever spousal sponsorship application that you choose to apply for, it is essential that you convince the Immigration officer of the genuineness of the relationship. Therefore, as much evidence that you can provide to Immigration Canada will be extremely beneficial for the strength of your application. For instance, you may provide joint documentation, photos, receipts, and other important documents that you feel will prove your relationship is real. If you have a spouse that you would like to sponsor, we can help you with this process. Applying for a Spousal Sponsorship can be confusing if you are unfamiliar with how Immigration applications work. Moreover, any Immigration application can become overwhelming if done alone; therefore, it is highly recommended that you seek out professional and experienced help before attempting to apply. Here, at Akrami & Associates, we work and have experience with many different immigration issues. We have helped many of our clients be reunited with their spouses here in Canada. If you believe that you might be eligible to sponsor your spouse, please feel free to contact Akrami & Associates at our office at 416-477-2545 for more information or if you would like to book a consultation with an immigration professional for more advise.